“MEN NEED MEN” is an incredible, newly-released documentary about men’s groups that come together to talk about personal subjects. Seven high-profile men’s work interviewees, including our very own Dr. Stephen Johnson, provide a ‘behind the scenes’ look into how men’s groups operate, and why men find understanding and comradeship within this type of forum. Click here for Dr. J’s video (YouTube/Facebook). “Men Need Men” presents powerful views from the East and West, from the young and old, from the timid to the bold. We learn how men come to trust one another in this sacred setting and speak without the fear of being shamed, as they confess and confront, validate and support. LOVE RELATIONSHIPS __ In particular, this documentary takes a serious look at how men’s groups affect love relationships. The interviewees report gaining clarity and stability and self-confidence and require less assurance from their partners. ANGER & CONFLICT __ Specific attention also goes to conflict. As men feel safe expressing anger unapologetically, they process forgotten wounds and thereby find acceptance and kindness. Dr. Johnson candidly explains profound male insights he has learned from the elders of his generation (L to R): Robert Moore, Robert Bly, Malidoma Some’, James Hillman, J. Marvin Spiegelman and Michael Mead. 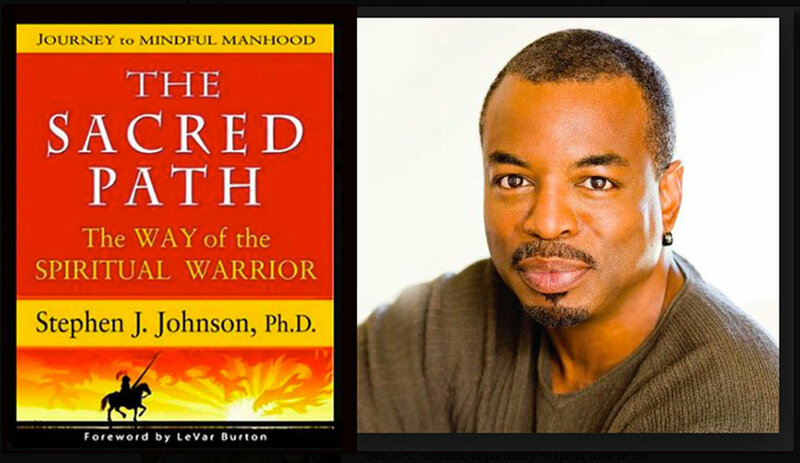 Stephen J. Johnson, Ph.D. is the author of “The Sacred Path – The Way of the Spiritual Warrior” and has been a practicing, licensed psychotherapist for over forty years. His involvement with the men’s movement spans over three decades. Through his clinical interest in, and understanding of, men’s issues, Stephen has been inspired to work intensively with men’s groups, men’s retreats, and outreach programs. Stephen delivers insights into how a man’s beliefs and behaviors are shaped. He describes how a man can utilize different methods to better support himself, as well as his relationship with his partner. He delves into how stories and myths have taught men to reflect on who they are, how the roles of fathers differ from those of mentors, and why men are drawn to nature and a sense of adventure. Stephen also touches on a man’s varied states of vulnerability, both within romantic relationships and within a men’s community. He explores what it means to show up as a “mindful man” and a “spiritual warrior” in this time of complexity and uncertainty. There was certainly a very strong need in the world for this important men’s work when Dr. Johnson was divinely guided to embark on this Sacred Path over 30 years. And today, this work is more pertinent and relevant and needed right now than ever before. Check out the video (YouTube/Facebook) and also visit www.MenNeedMen.com to show your support and help continue this important work. Men need men. Yes, it’s so true. “Bring good men together and bring out the best in them.” We’re ALL in this together. Click video link at left to discover the meaning of these words and Dr. J’s incredibly rich 33-year tradition of bringing good men together on the mountain.